Sweet Potato Baked in skin, flesh only has 6.1 times more Vitamin A, 2 times more Thiamine, 1.2 times more Vitamin B2 and 1.5 times more Vitamin B3 than Raw Red Sweet Peppers. While Raw Red Sweet Peppers contain 6.5 times more Vitamin C, 2.2 times more Vitamin E, 2.1 times more Vitamin K and 7.7 times more Folate than Sweet Potato Baked in skin, flesh only. Both Sweet Potato Baked in skin, flesh only and Raw Red Sweet Peppers have similar amounts of Vitamin B6 per 100g. Sweet Potato Baked in skin, flesh only has 5.4 times more Calcium, 9.5 times more Copper, 1.6 times more Iron, 2.3 times more Magnesium, 4.4 times more Manganese, 2.1 times more Phosphorus, 2.3 times more Potassium, 9 times more Sodium and 1.3 times more Zinc than Raw Red Sweet Peppers. 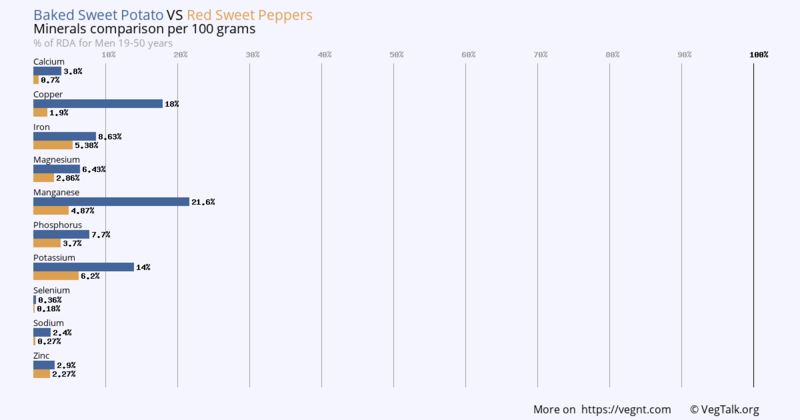 Both Sweet Potato Baked in skin, flesh only as well as Raw Red Sweet Peppers have insufficient amounts of Selenium in 100g. Sweet Potato Baked in skin, flesh only has 2 times more Protein, 3.4 times more Carbohydrate, 3.5 times more Energy, 1.5 times more Sugars and 1.6 times more Fiber than Raw Red Sweet Peppers. 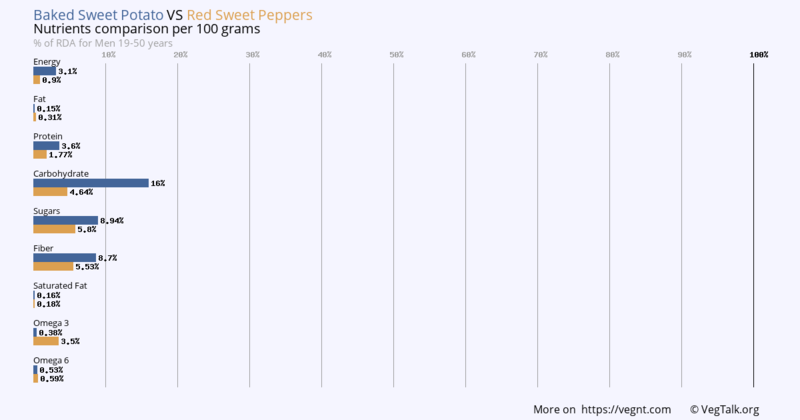 While Raw Red Sweet Peppers contain 9.3 times more Omega 3 than Sweet Potato Baked in skin, flesh only. 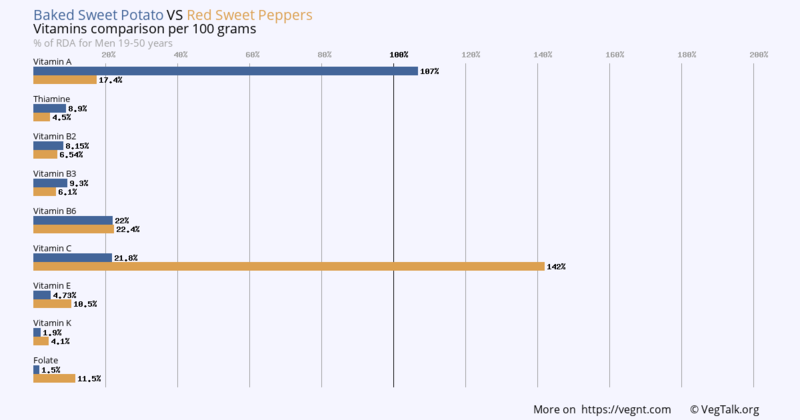 Both Sweet Potato Baked in skin, flesh only and Raw Red Sweet Peppers have similar amounts of Water per 100g.Both Sweet Potato Baked in skin, flesh only as well as Raw Red Sweet Peppers have insufficient amounts of Fat and Omega 6 in 100g.